Its been a year of ………. difference. I think there’s probably a lot more that I haven’t digested yet, but then another difference just surfaced. This is the year we offered to home school Andrea. Its nothing new for some families but its something I never imagined I would be doing. I threw the idea away many years ago because I didn’t have the confidence to do it. The desire to spend more time with her, and having a hand in moulding good character gave us the courage to plunge in. Of course it helps that some local colleges are now “home school friendly”. Well, technology has certainly given home schooling a boost. You’ll see why soon. I’m sharing this in the hope that others considering home schooling their children will be helped. As far as I know, there are 4 methods of home schooling. 1) Traditional home schooling where the parents teach the children entirely using books from either a home schooling (or a few different ones) centre or from a government syllabus. 2) Home schooling using CDs or hard drives sent by home schooling centres, or by downloading materials from the internet. 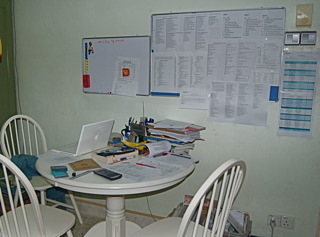 3) Online homeschooling where the student learns everything from the home schooling centre via the internet. This does not have to be in real time. 4) “Private school” home schooling where the students are sent to a place with other home schoolers and are taught by one or a few teachers. We decided on option 3 as I do not feel I can handle form 4/grade 10 work. So Andrea is now home schooling under the Alpha Omega Online Academy. Basically, she is using the American Grade 10 High School syllabus, but doing her studies online, and on her own. My role is to guide and to teach if necessary. All assignments, tests and quizzes are uploaded and marked by the academy teachers. All academic records are kept by them too. There is a guided schedule given, but there’s nothing to stop a student from completing work ahead of schedule and then taking a few days break. So, after some teething problems (basically we didn’t understand how things were to be done), we have kind of settled into a pattern of some sort. The first thing I did was to transform Andy’s room into a classroom. 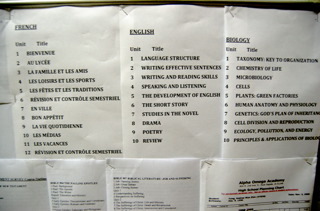 The stuff on the wall are the course outlines for the 7 subjects Andrea is taking. Her subjects for Grade 10 are Biology, English II, French I, Geometry, World History, New Testament Survey and an interesting subject called Fitness Fundamentals. 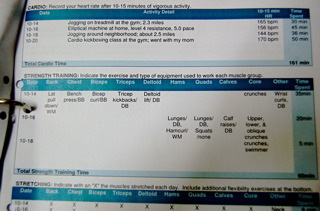 I call it interesting because Andrea doesn’t particularly like exercising but this course demands that she exercises 3 times a week, consisting of 90 minutes of cardio, 30 mins of strength training and stretching. 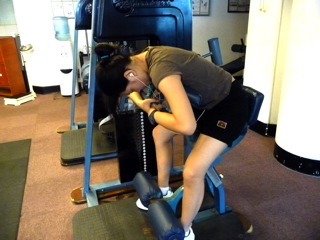 Its also interesting because its getting me back to the gym after 2 years’ leave of absence! 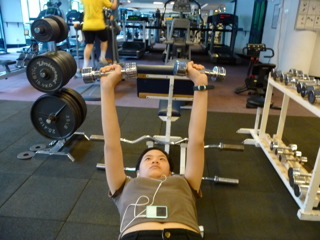 So, its really going to be good for both Andrea and I, as far as being fit is concerned! Actually I am not a fan of home schooling. While I acknowledge that it can be better for the child if done properly, but you would have deprive Andrea’s friends of her positive influence on them. Being with her friends at school gives a wonderful, well grounded Christian kid the opportunity to share the Gospel with her friends. Imagine if all the Christian kids were taken out of the public school system. What would happen the the SCF in all these schools?!? It is just like taking all the Christian out of this world. Who would go and tell people about Christ! Just my opinion! Don’t take it to heart ah! Big move. God bless. Loads of work. I know of kids who are home schooled – both in Malaysia and in NZ and of course in countries like Cambodia where I know of 2 missionary couples who home school their kids. Loads of pros and cons. I tend to think along Reuben’s lines but I am sympathetic to those who choose to homeschool in Malaysia as I think the secondary school system is pretty lacking. yup, the pros and cons are definitely there – and what you say about the sch system is true too. do you know that the passing mark at school level is now 35? my children are great examples of how the lower passing mark eventually makes the students lower their standards. they say, “but I passed” …..! but what a pass! so what’s the actual level of students who obtained strings of A’s? sure, there are the 100% marks kind of straight A students, but there are also those who obtained about 75-80 and got an A. PROBLEM – they think they ARE that great! I shudder when I think of slightly above average students getting into courses like engineering and medicine and think that they are really that good! 75% an A? Yikes. Standard has dropped even further! Paul, in fact, I didn’t even give you the most accurate marking scheme – 75% an A is for Form 1 – 3, at Form 4 – 5, a mere 65% gets you the A!!!! For all that we Malaysians scoff at the orang putih, thinking that the Asians are the ones who are more hardworking, our standards are getting way below the line. Anna was just telling me the other day that her 89% in photography didn’t get her an A at her uni, she’ll need something like a 92 for that! and her passing mark is 65%. And Andrea’s home school sets 85% as the passing assignment/quiz level before she can move on to take the test on any topic. That’s more like it. Ever wonder why only a few of our “strings of As” students are heard of at the universities in UK, US and Australia? 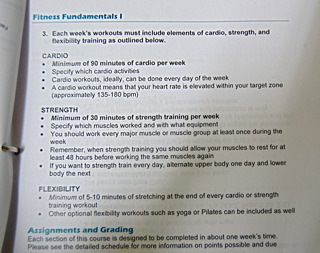 Fitness Fundamentals sounds good!! How nice if i could sit for that exam =). CrisisMaven’s Economics Study Guide. It also contains a Reference List which aspires to eventually become the “one stop shop” for all economic data series, history, bibliographies etc. Good to hear you are homeschooling. Your definitions are not far wrong, but homeschooling is whatever works at home with parents as the primary teacher.